The printer is printing over and over on the same disc -or- an Out of Paper message appears after the first disc is printed -or- the cartridge (left) light is flashing slowly after the disc is printed. This problem can be caused by several items. You may have a problem with how you set up your label. If you have multiple CD faces selected for this particular label, it will print over and over on the same CD or give the out of paper message. In SureThing above the label you will see a tab named CD Face (1 of 1). If you see anything other than (1 of 1) you will have problems printing multiple labels on one CD. 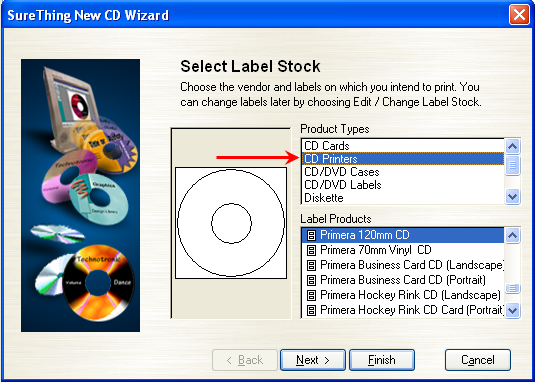 Click the Del... button to delete extra CD face layers, recreate the label or try another label. Other design programs such as Adobe Photoshop may have similar features that could cause multiple labels to print on the same disc. Recreate the label or try printing a new label. If you have SureThing Deluxe 4.x there are many different CD/DVD template options to choose from when setting up your label. Make sure you select the correct template as shown in the diagram below. Certain SureThing merge file setups may cause this problem. Try a label without a merge field. Make sure your PC is up to specifications and that you are not running other programs or using other peripherals while the unit is running. It is very sensitive to system resources and uses them heavily especially when burning and printing at the same time. Your PC should at least be a 700 MHz Pentium III processor, 512Mb RAM. Try running your job on another computer.